"He didn't just push the envelope," says sports radio host and former ESPN anchor Dan Patrick. "He bulldozed the envelope." Scott was remembered through an outpouring of tributes by athletes, colleagues and fans on Twitter and statements from his alma mater, the University of North Carolina, which said that "his legacy will live on in many ways -- as a friend, a son, a father, a professional and forever, a Tar Heel," and President Barack Obama. "I will miss Stuart Scott. Twenty years ago, Stu helped usher in a new way to talk about our favorite teams and the day's best plays. For much of those twenty years, public service and campaigns have kept me from my family -- but wherever I went, I could flip on the TV and Stu and his colleagues on SportsCenter were there. Over the years, he entertained us, and in the end, he inspired us -- with courage and love. Michelle and I offer our thoughts and prayers to his family, friends, and colleagues," the president said. Moments of silence were held at sporting events around the United States on Sunday, including the NFL wild-card games between the Cincinnati Bengalsvs.Indianapolis ColtsandDetroit Lions vs. Dallas Cowboys; theMavericks-Cavaliers NBA gamein Cleveland and at several college basketball games. Scott saved his best for his last year on the air. At the ESPYS on July 16, shortly before his 49th birthday and following another round of cancer surgery, Stuart accepted the Jimmy V Award for Perseverance with strength, humor, grace and these eloquent words: "When you die, it does not mean that you lose to cancer. You beat cancer by how you live, why you live, and in the manner in which you live." 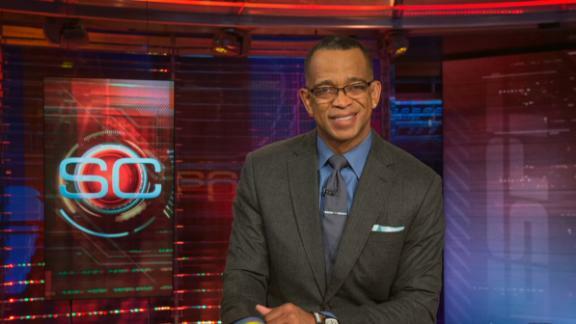 So while the grief is deep at ESPN over the death of Stuart Scott, so is our gratitude. He was as popular on campus as he was in the airports he passed through and on the sidelines he worked over the last 22 years. He brought so much to the party, and he will continue to do so, through the people he inspired, and the language that he liberated, and the audience that will remember him. Steve Levy, who came to ESPN shortly before Stuart in August 1993 and served as his co-host for the first "SportsCenter" from the new studio last June, put it this way: "I think the audience recognized that when Stuart was on, there was going to be something special. And to his credit, he brought something special every night he was on." "SportsCenter" anchor Jay Harris, who grew up watching -- and hoping to be -- Stuart, says, "Think about that phrase, 'As cool as the other side of the pillow.' It's a hot, stifling night. You're having trouble sleeping. But then you think to turn the pillow over, and, wow, it's cool, and it feels so good. "Well, that's who Stuart is. He is 'the other side of pillow,' the man who made sportscasting cool. God bless whoever it was who thought to rearrange the bedding at ESPN." Stuart was born in Chicago, but he, along with two sisters and a brother, spent his formative years in North Carolina, where their father was a postal inspector who always had time to play after work. Stuart went to R.J. Reynolds High in Winston-Salem and then the University of North Carolina, where he played wide receiver and defensive back on the club football team, joined Alpha Phi Alpha and worked at the student radio station, WXYC. After graduating in 1987 with a degree in speech communication, Stuart was hired by WPDE-TV in Florence, South Carolina. He says that's where he first came up with the pillow metaphor. "People say I stole it from a movie," he told an interviewer in 1998, "but I first thought of that and said it on my first job ... I just liked it." His career path took him from Florence to Raleigh, North Carolina, to Orlando, Florida, and in his pre-ESPN clips, you can feel his energy, hear his music and sense his on-camera charisma. At WESH, the NBC affiliate in Orlando, he first met ESPN producer Gus Ramsey, who was beginning his own career. Says Ramsey, "You knew the second he walked in the door that it was a pit stop, and that he was gonna be this big star somewhere someday. He went out and did a piece on the rodeo, and he nailed it just like he would nail the NBA Finals for ESPN." He first met ESPN anchor Chris Berman in Tampa, Florida. "He stuck out his hand and said, 'One day I look forward to working with you,'" Berman said. "And I said, 'Well, I tell you what, we'll save you a seat.' And I'm really thrilled that he was right on. [Later] I said, 'Stu, maybe you were the Swami.'" The person most responsible for bringing Stuart to Bristol was Al Jaffe, ESPN's vice president for talent, who was looking for sportscasters who might appeal to a younger audience for ESPN2. "One of the producers on a story we were doing on the Orlando Magic told me about this young guy he really liked. I followed up and found out that Stuart's contract was up soon. He sent me a tape, and even then, he had an amazing presence -- I felt the viewer would sit up and take notice when he was on the air." His first real ESPN assignments were for "SportsSmash," a short sportscast twice an hour on ESPN2's "SportsNight" program. When Keith Olbermann graduated from "SportsNight" to ESPN's "SportsCenter," Stuart took his place in the anchor chair. "He was like a ball of fire walking in the door," says ESPN senior vice president Mark Gross, a coordinating producer at the time. "I had never met anybody like Stuart Scott." "I've called him Boo-Yah forever," says Norby Williamson, the ESPN senior vice president who helped guide Stuart during those early years. "Ever since he used that catchphrase on the air for the first time, and we looked at each other and said, 'What the hell is that?'" That was the future, and it looked and sounded different from the present. "There were successful African-American sportscasters at the time," says ESPN director of news Vince Doria, who oversaw the studio programming for ESPN2 back then. "But Stuart spoke a much different language ... that appealed to a young demographic, particularly a young African-American demographic." Suzy Kolber, the ESPN anchor who also began at ESPN2, says, "Stuart called me his TV wife, but we really were like a family, trying to launch this brand-new network and spending all this time together. Fortunately, some of us lasted longer than ESPN2 did. "When he went to ESPN, Stuart didn't change his style -- and there was some resistance. Even I encouraged him to maybe take a more traditional approach, but he had a strong conviction about who he wanted to be, and the voice he wanted to project, and clearly, he was right, and we were wrong." Gus Ramsey, who arrived in Bristol in 1994, remembers exactly when he knew Stuart had found a new audience. "In the fall of '95 I asked him if he wanted to go to my high school homecoming football game in Greenwich, Conn., and he said, 'Sure, let's go.' We got there mid-first quarter, and we just kind of walked up to the sidelines, and one by one, the kids start comin' over to him. It didn't hit me until that moment that this guy was making an impact." But as Stuart's star rose, so did the vitriol of those who resented his color, or his hip-hop style, or his generation. He received a lot of hate mail, most of it anonymous. If the senders did leave a name and address, Stuart would answer and ask them to tell him what the problem really was. He was disarming in other ways, as well. He may have represented new school, but he was decidedly old school when it came to preparation. Nobody could ever say he didn't work hard, or labor over his "SportsCenter" lead-ins. "He was really conscious of getting it right," says ESPN anchor Linda Cohn. "He had that great balance of being entertaining and being right." And as cocky and brash as he was, he liked nothing better than to sing a good duet every night. For years, he and Rich Eisen would do just that on the 1 a.m. "SportsCenter," a show that made its way to the next day's water cooler thanks to their chemistry -- and repeated viewings. Yes, there was an Ebony and Ivory theme to their show, but more importantly, they were two young sports nuts playing off one another for the benefit of other young sports nuts. Eisen, now the lead anchor for the NFL Network, says, "Who would have thought the perfect guy for me, a Jewish kid from Staten Island, would be an African-American guy with North Carolina roots? Sometimes neither one of us knew who the other was talking about, but it worked. It was always a trip doing a 'SportsCenter' with Stuart." ESPN anchor John Anderson likens the talent wave at the network to NASA's astronaut programs. "There was the Mercury program, which gave us Chris Berman and Bob Ley, great pilots who went up there without teleprompters or whatever. Then along came the Apollo astronauts, like Keith Olbermann and Dan Patrick, Rich Eisen and Stuart. They took us to the moon ... and left the rest of us to fly the space shuttle." The confines of a studio could not hold Stuart. Before the millennium arrived, he was covering the MLB playoffs, the Final Four and the NBA Finals. He wrote for ESPN The Magazine and went one-on-one in interviews with Tiger Woods and Michael Jordan. Once the century rolled over, he did pretty much everything, hosting game shows and New Year's Eve specials, sitting down with President Obama, and becoming the guiding light for NBA and NFL coverage. There were a few downs mixed in with the ups, though. He suffered an eye injury while trying to catch a pass at a New York Jets mini-camp, necessitating surgery that put him out of work for a few months. His marriage to Kimberly Scott, the mother of their daughters, came to an end. And on Nov. 26, 2007, while covering a "Monday Night Football" game between the Steelers and Dolphins, Stuart had to have an emergency appendectomy that revealed a malignancy requiring additional surgery. Through it all, Stuart remained upbeat and defiant. "That's what I love about him," says Kolber. "No matter how big he got, no matter how bad it got, he never changed. He loved his work, he loved his daughters, he loved being Stu." And he continued to do "SportsCenter." "Nobody, with the possible exception of Chris Berman, does highlights as well as Stu," says Kolber. Competitor. "He wasn't as good an athlete as he thought he was," says Harris, a frequent golfing partner. "But he was the best-dressed guy on the course." Patrick remembers an epic basketball game at the YMCA. "Stuart was playing like it was the seventh game of the NBA Finals, and he's guarding me like I'm Michael Jordan. ... I drive to the hoop, he undercuts me, I fall on my back and nearly pass out. I go back out on the floor, say, 'Give me the damn ball,' Stuart D's me up, make the shot, walk off the floor and go to the emergency room because I chipped a vertebrae. "I recently told that story on the air. And Stuart tweets, 'You may have scored, but I sent you to the hospital.' That's my Stuart." That competitive nature always made for a better show. According to anchor Scott Van Pelt, "Stuart would always say to me, 'Game recognizes game.' You try to bring out the best in yourself so you can bring out the best in the person next to you." Friend. For all his fame, Stuart was buds with everybody in Bristol, be they production assistants or co-hosts or executives. "He was Stu to everybody in the halls," says Anderson, "but Stuart on the air. I found him to be one of the few people in this business who is actually much nicer off TV than he is on. He was just one of the first guys to say, 'Hey, I'm going to play golf, wanna come with me?'" His offer of friendship took on a deeper meaning for ESPN vice president Tim Scanlan: "When he found out that my wife had the same type of cancer he had, he was one of the first people to reach out to me and offer help. He started giving me advice ... and I in turn would talk to my wife. And every time she saw him on the air, you could see a noticeable pick-up in her spirit and energy and in her ambition to fight another day." "NBA Countdown" anchor Sage Steele remembers the day last year when her family moved from Connecticut to Arizona to be closer to her show in Los Angeles: "The moving trucks were at my house, and Stuart was there with his girlfriend Kristin to say goodbye to us, and my 10-year-old son Nicholas had to say goodbye to his best friend across the street, and he came back sobbing, sobbing, leaving his best friend in the world. ... Stuart said, 'I got it.' And he took Nicholas aside and just sat down with him and described his moving away as a kid, losing his best friend as a 10-year-old boy and how he handled it. He spent 20 minutes sitting there with Nicholas, helping him feel better. "Stuart spent three hours at our house that day, in pain and hardly able to stand, but he did it. And he sat there for my kid." Celebrity. At a certain point, Stuart became as famous as the athletes he covered. That's partly why he starred in so many "This is 'SportsCenter'" commercials, alongside Tiger, Kobe, Keyshawn, LeBron, Mr. Met ... and Chad Johnson, who rejected Stuart's idea for a touchdown celebration with "Boo-No!" Eisen was there at the birth of his fame. "The Saturday night before the NBA All-Star Game in New York City. Stuart and I had to do the 11 o'clock 'SportsCenter,' so with a lead foot, we got to Times Square at around 2 in the morning, and the party at the All-Star Cafe with Gretzky and Shaq and Tiger is letting out. A cop gives us the coordinates for the afterparty, and now we're walking to 33rd and 10th Avenue ... Stuart walking down the street was like Elvis entering the building. People were stopping us every two feet. I'll never forget when one person went up to Stuart and me and said, 'Hey, wow, Stuart Scott!' Then the guy looks at me and goes, 'And the white guy. I love you, the white guy!' And Stuart laughed so hard because it sort of confirmed his belief that he provided me with street cred." African-American. ESPN knew enough to have sportscasters who represented 45 million Americans, not to mention 80 percent of the players in the NBA and 70 percent of those in the NFL. What we didn't know, until Stuart got here, was how important it was to have someone who could relate to them. "He was a trailblazer," says ESPN anchor Stan Verrett, "not only because he was black -- obviously black -- but because of his style, his demeanor, his presentation. He did not shy away from the fact that he was a black man, and that allowed the rest of us who came along to just be ourselves." "Yes, he brought hip-hop into the conversation," says Harris, "but I would go further than that. He brought in the barber shop, the church, R&B, soul music. Soul, period." Some of his best moments on the air came when he adopted the persona of a preacher: "Can I get a witness from the congregation?!" And one of his best moments off the air came when a producer suggested he change a reference on his NBA show from Omega Psi Phi, the fraternity of Michael Jordan and Shaquille O'Neal, to something more universal, like Animal House. "I have friends who have no idea what that movie is about," Stuart told him. "That movie was made two decades ago, and black fraternities have been around since 1906." Worker. "I never found him without a statistic to back up what he was saying," says Patrick. "He wanted you to know that he knew what he was talking about, and he never failed." There were times in the last few years when his friends worried that he was working too hard. "He'd be tired," says anchor John Buccigross. "But once he sat down in the chair ... he would just start to click in and get that zero focus ... 'Where's this guy from?' ... 'Who has the most triples of all time?' Once he got into the show, you just forgot about everything, and it was just Stuart Scott doin' 'SportsCenter,' havin' fun." Poet. "Listen to his lead-ins," says Buccigross. "They're thoughtful and precise, really well-constructed lead-ins to a news story or big game or moment." Yes, he would reference Tupac, but he also would quote Shakespeare: "full of sound and fury, signifying nothing." As for Stuart's most famous line, Eisen discovered one night that it was not what's up on the wall in the new studio. Recalls Eisen: "He would write down the catchphrases on the specific portion of the highlight, so I would watch him do this, and it wasn't 'Boo-Yah,' it was 'Boo-Yow.' He would spell it out B-O-O dash Y-O-W. He was a technician when it came to that sort of thing. I remember being jarred, and when I asked him about it, he thought I was making fun of him. But I wasn't." Father. "His girls mean everything to him," says Harris. "I mean his girls mean everything to him. He would easily take Stuart Scott, dad, over Stuart Scott, 'SportsCenter' anchor." "He's a great, great dad," says Ramsey. "He just takes so much pride in the girls, and you can't see him without him taking out his phone and showing you a video of Taelor or Sydni singing or dancing or playing soccer." Occasionally, Stuart would give a shout-out to Sydni's soccer team, but that was easy compared to another commitment he made to his daughters. "His daughters and my daughters danced at the same studio," says Anderson. "One year we went to their performance of 'The Nutcracker.' And here comes Uncle Drosselmeyer, and I thought, 'That man looks a lot like Stuart Scott,' and it was -- he was there for his girls. I'll never forget him coming out in this big cape, swooping in with his nutcracker, and he was great. I'm not sure the dance steps were up to Baryshnikov, but certainly the intentions were." Charmer. Stuart's role in "The Nutcracker" was not unlike one of the roles he played at ESPN. For those not up on their Tchaikovsky, Uncle Drosselmeyer is the toymaker who brings the tableau to life at midnight -- sort of what Stuart did in Bristol. Anderson calls it "magic." Harris calls it his "Stuartness." It's this ineffable way Stuart had of welcoming you to the party, bringing you into his confidence, making sure you were having a good time. A classic talent like Vin Scully might ask you to pull up a chair. Stuart would bring you a beer and introduce you to Tiger or Michael or Peyton. Warrior. Stuart and Steve Levy share one personal career highlight: Taking "SportsCenter" to Camp Arifjan in Kuwait in 2004. "The soldiers kept coming up to thank us, and we're like, 'No, we're here to thank you.' Stuart and I were both patriotic, but this took it to a whole new level of respect for what our men and women in uniform go through." Ten years later, Levy watched a different kind of warrior go to work. "He was so tired. We'd be waiting for a game to end, and he'd close his eyes. ... That wasn't the Stuart Scott that I worked with for so many years. And yet, when the red light came on, when he was on camera, you had no idea. He never slipped. His ability never slipped, and the audience at home couldn't tell what Stuart was dealing with." In a telling piece in The New York Times in March, Richard Sandomir spent the day with Stuart as he worked out at a martial arts studio in West Hartford, Conn. At one point, he lifted up his EVERYDAY I FIGHT shirt to reveal the scar from his abdominal surgeries. "I never ask what stage I'm in," Stuart told Sandomir. "I haven't wanted to know. ... I'm trying to fight it the best I can." Champion. On June 15, 2014, Stuart flawlessly handled the trophy presentation to the Spurs -- after doing 300 push-ups that day. "We stood on the floor," says Williamson, "and there's all these things going around -- and immediately we snapped back to 20 years ago ... and I just ... told him I was proud of him, and I loved him." A month later, as Steele watched Stuart climb the steps to the stage at the ESPYS, she worried about whether he could deliver his speech. "But then I reminded myself, 'Hello, who are you talking about here? This is Stuart and he's not going to let this moment get away.' ... Raw and honest, powerful and indelible. ... He owned it, just like he owned every sportscast, every 'SportsCenter,' every 'Monday Night Football' show he did. He owned it." Since that night, "You beat cancer by how you live" has become a rallying cry for millions of patients and their families. ESPN.com senior writer Andy Katz and ESPN feature producer Miriam Greenfield contributed to this story. 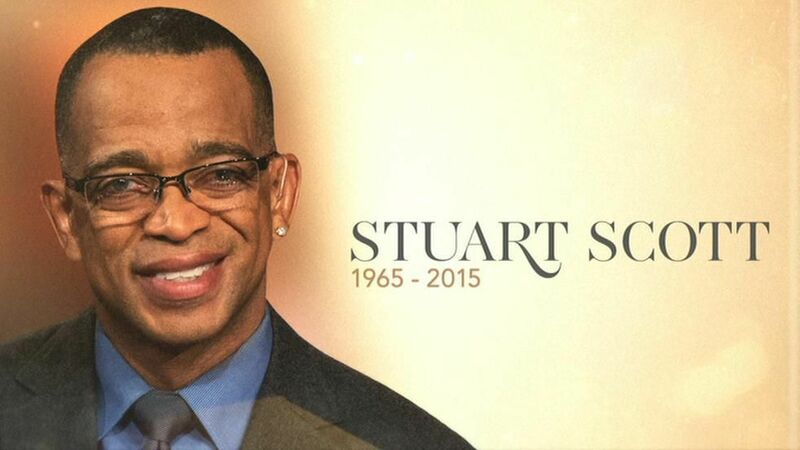 Stuart Scott, a longtime anchor at ESPN, died Sunday morning at the age of 49. He inspired his colleagues with his talent, his work ethic, his personality and his devotion to his daughters Taelor, 19, and Sydni, 15. 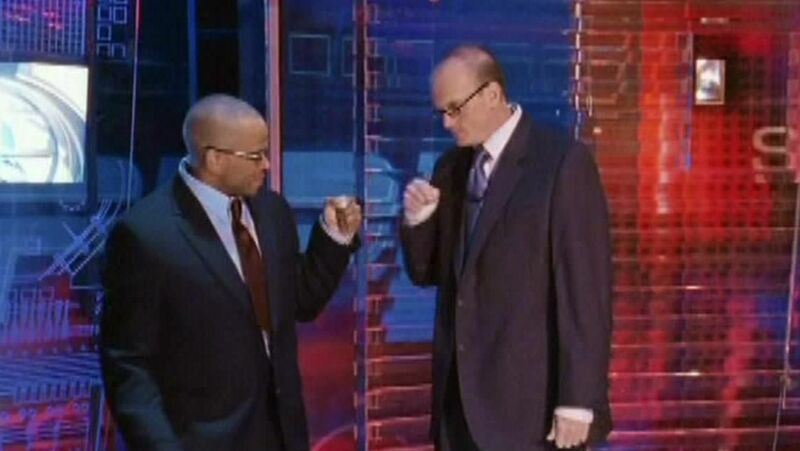 Rich Eisen pays his respects to former colleague Stuart Scott and looks back on their time together on "SportsCenter." 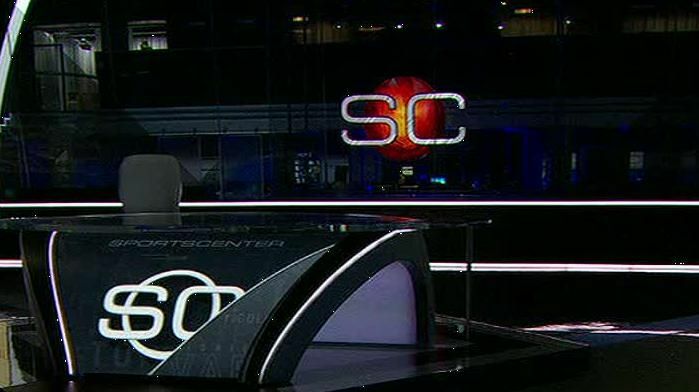 As Scott Van Pelt and Steve Levy say farewell to Stuart Scott, "SportsCenter" leaves a chair empty in his honor. Chris Berman, Rich Eisen, Dan Patrick and Gus Ramsey look back on their time working with Stuart Scott. Chris Berman reflects on his respect for longtime colleague Stuart Scott's talent, career and life. Michael Wilbon looks back on his friendship with Stuart Scott and how much support he received from Scott, especially after having a heart attack. Tom Jackson, Cris Carter, Mike Ditka and Keyshawn Johnson share their emotional memories of Stuart Scott. Rich Eisen joins Scott Van Pelt on SportsCenter to remember their friend Stuart Scott. 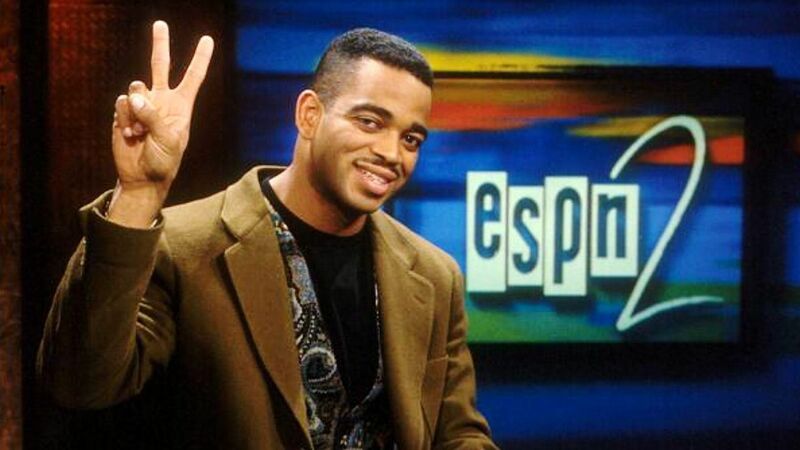 Take a look back at Stuart Scott's best "SportsCenter" commercials. 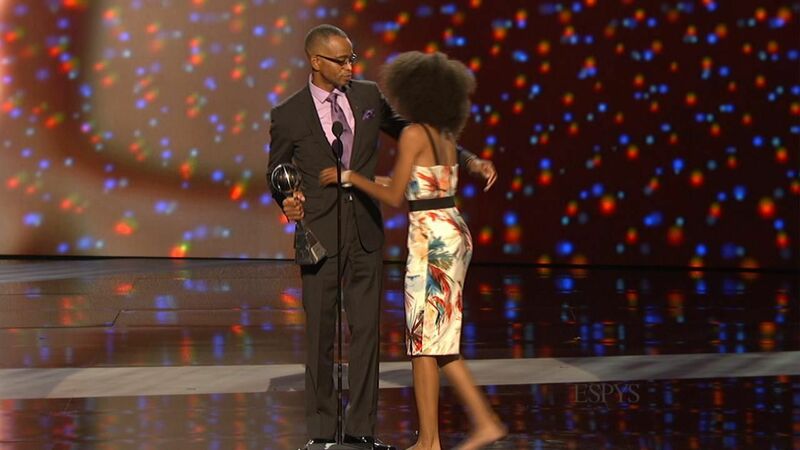 Stuart Scott Wins the Jimmy V Award for his courageous fight against cancer.